Juneau, Alaska had its 4th annual EV Round UP on 9-9-17 where over 250 participants were served local and national level EV information along burgers and hot dogs under party tents. We also had Spy training and EV charger information. This became a great forum and event to mix current EV and prospective EV owners. Many EV test drives were provided and Juneau participants were able to see a recent GM Bolt and BMW i-3 along with a unique demonstration of Torqeedo electric outboard boat motors. 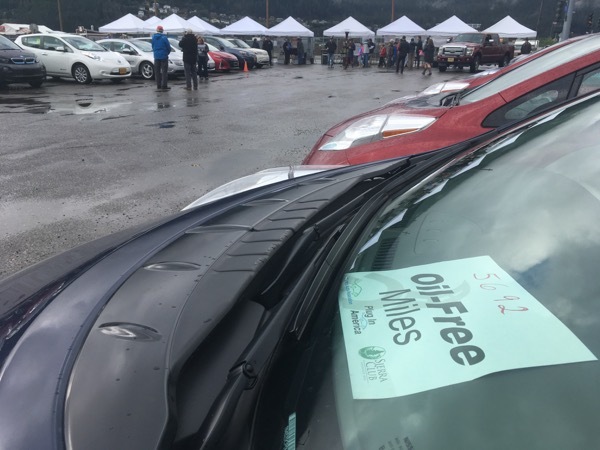 Our EV Round UP was hosted by the Juneau Electric Vehicle Association (JEVA) and the event held on the Juneau District Heating Facility’s downtown location to accommodate larger turnout this year of 70 vehicles. Three locally elected Assembly members attended of which one is an EV owner, one is purchasing an EV and one is considering an EV purchase for driving in our “perfect EV community”. Our local government just awarded $25,000 for new EV chargers for Juneau. Participants were asked where to put new charging stations in Juneau and when Juneau would reach 500 EV’s (we now have 200). Juneau’s electricity if virtually 100% hydropower so the JEVA logo is “Driving the Rain”. A drone video was made of the event. Our event was sponsored with financial and volunteer assistance from local sponsors: Renewable Juneau, Juneau Economic Development Council, Avista, Tongass Rain, Juneau Commission on Sustainability, Juneau District Heating, IBEW Local 1547, Juneau Hydropower, Alaska Grafix, and Wingnut Auto Salon. Additionally, Bellingham Nissan sent a dealer representative to Juneau. We received fun promotion from local radio stations and our event was a front page news feature. Juneau, Alaska is recognized as one of the fastest growing Electric Vehicle communities with aggressive policies in promoting electric vehicle transformation. Juneau is Driving the Rain and leading Alaska’s efforts for Electrical Vehicle Transformation while establishing Juneau as a leading Sustainable City. Come join the fun and learn why Juneau is EV ground zero. Family EV event with Juneau Tesla's, LEAFs, Volts, local modified EV's, as well as a host of new EV models hitting Juneau's streets every day. Where: 300 Egan Drive. Subport Parking Lot right across from Centennial Hall. Downtown Juneau. Registered attendees report 1,289,499 electric miles driven. How much could electric vehicles put the brakes on Alaska’s oil economy?